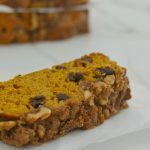 It is really hard for me to say if I prefer this version of chocolate chip pumpkin bread or the other version I made last week. I made both on the same day and one loaf was finished off a lot faster than the other. Any guesses which one that might be? I used the same recipe for both of my pumpkin bread recipes but added pepitas and walnuts on one loaf for a healthier version. One that Sawyer would be more likely to eat. 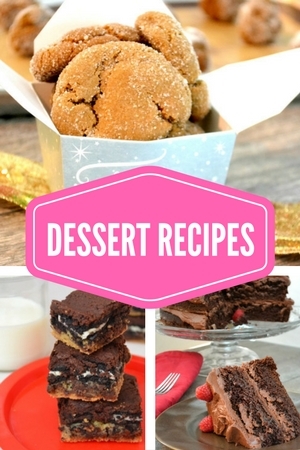 I also made this one…..with lots of chocolate and the crunchy and sweet streusel topping that I knew Nova would eat. I have a weakness for chocolate chips and seemed to have passed it down to Nova. 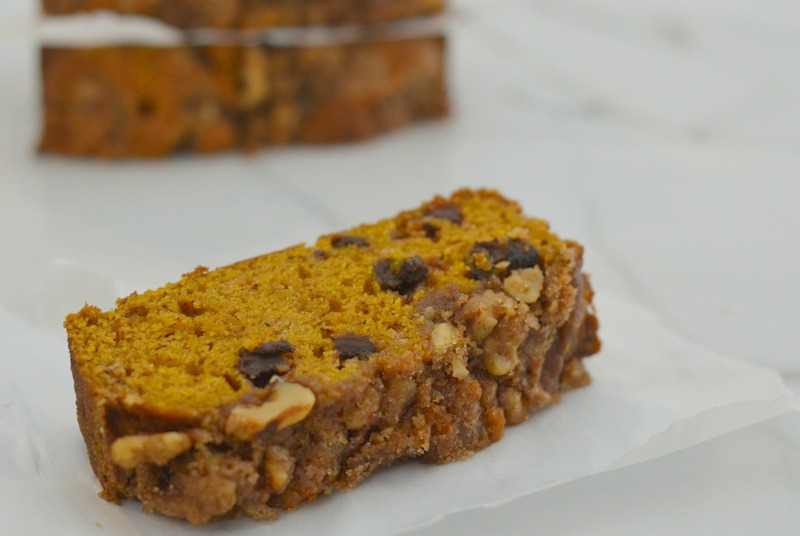 The recipe makes two loaves of pumpkin bread so you can make one of each if you prefer. Try it! Let me know which version you like better. 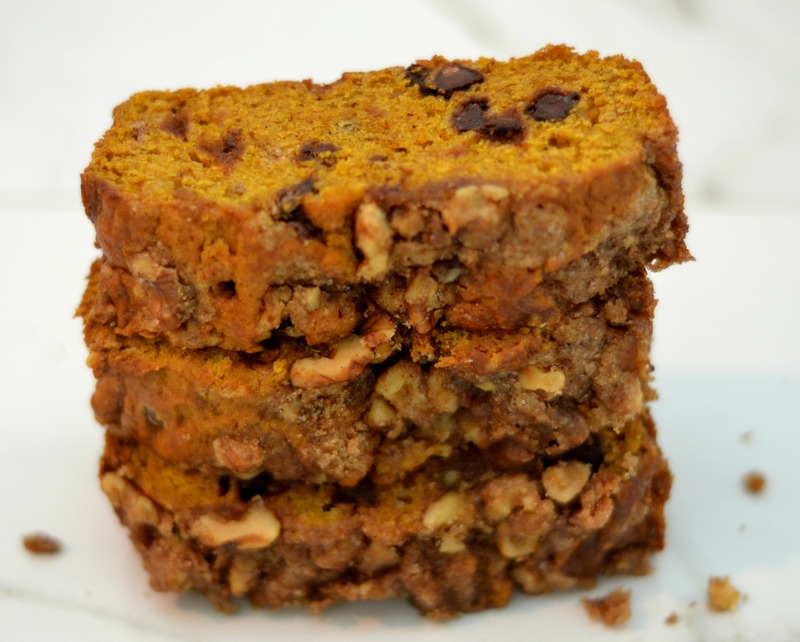 A decadent version of pumpkin bread filled with chocolate and sprinkled with a crunchy and sweet streusel topping. Preheat the oven to 350°F. Butter 2, 9 x 5 inch loaf pan. In a separate bowl, whisk the melted butter and sugar. Add the eggs, one at a time, mixing well after each. Stir in the pumpkin until smooth. Fold in the dry ingredients. Mixing gently until the batter is smooth. Make streusel topping by combining the streusel ingredients in a small bowl using a fork to combine. The goal is to come up with a crumby texture. Sprinkle the top of each loaf with the streusel topping. You might want to gently press them into the batter (not too deep) to make sure it bakes in just right. When you remove from the oven, it is important to let it cool for 20-30 minutes before removing from the pan. Once you do remove it from the pan, let it cool completely and then cut it into slices.